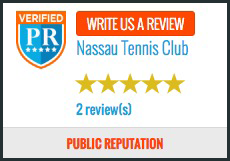 Nassau Tennis Club is proud to participate in the Eastern & Middle States Division’s’ Women’s USTA Summer Leagues. Teams begin to form in early Spring for the upcoming Summer season. If you are interested in playing on a USTA team, please email Teams@NassauTennis.net with your name, level and phone number. Founded in 1881, the United States Tennis Association (USTA) is the national governing body for the sport of tennis in the United States. In addition to owning and operating the US Open, Olympus US Open Series and selecting the members of the Davis Cup, Fed Cup and Olympic teams, the USTA administers a variety of programs nationwide for players of all ages and ability levels.